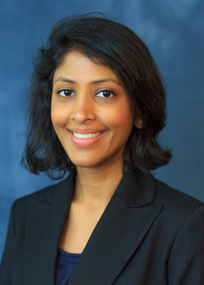 Praneetha Thulasi, MD, joined Emory Eye Center’s faculty in September 2017. She is part of the cornea, external diseases, and refractive surgery section. Dr. Thulasi graduated from Saint Louis University with a bachelor of arts degree in biology and a minor in mathematics and computer science. She then earned her MD and completed a one-year transitional program and her ophthalmology residency at Emory. After residency, Dr. Thulasi completed a fellowship in cornea, refractive surgery, and external diseases at the University of Illinois in Chicago. She has presented research at numerous conferences, including the American Society of Cataract and Refractive Surgery, the Association for Research in Vision and Ophthalmology, and the North American Neuro-Ophthalmology Society. Her work also has been published in professional journals such as the Journal of Refractive Surgery, Current Opinions in Ophthalmology, and the Annals of Emergency Medicine. Thulasi became interested in the life-changing potential of eye care after her grandfather’s loss of vision. “I believe strongly in universal access to vision care,” she says. “That’s why I spent time in Ethiopia during my residency, to learn more about access to care in developing countries." Dr. Thulasi is a member of the Georgia Society of Ophthalmology, American Academy of Ophthalmology, American Society of Cataract and Refractive Surgery, the Association for Research in Vision and Ophthalmology, and the Cornea Society. She is Board Certified by the American Board of Ophthalmology.